Big Train Farm Three Season 2019 CSA is Currently OPEN! Many people are familiar with CSA programs now, though 15 years ago they were virtually unknown in this area. CSA stands for “Community Supported Agriculture”. Taking part in a CSA program makes you a member of a co-op, a shareholder in a business where an investment of money brings you a weekly return of farm products. Taking part in a CSA program, like any shareholding investment, means that you share some of the responsibility with the growers themselves. For instance, you will be required to pick up your share every week. You will be directly in touch with the growing season in southern New England, and will notice the effects of both bad and good growing conditions. In the past nine years CSA members received more value in produce than their initial payment. A CSA membership can be very cost effective, especially when you consider the freshness and quality of the products. 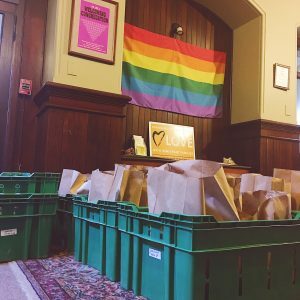 Read this blog post and see the financial return for our 2016 CSA members. Here is the monthly availability of different produce that we grow. These vegetables may not be available every week of the month, but generally we offer 12-20 different crops for you to choose from each week. We also offer a 14 week Winter Share, which consists of hearty greens we grow over the winter in our greenhouses, as well as storage and over-wintered crops. Details for the winter share will be available towards October/November. Our CSA is not pre-bagged. You will get to choose 90-100% of your share each week. A portion of the weekly harvest will be available to you at the pick-up. You will be given a “credit”, an amount of money to “spend” at the pick-up. Prices will be listed and you will shop until all your credit is spent. Also, certain items will be given on top of your credit amount. These will be either bumper crops (surplus items) or restricted items. For example, squash and tomatoes can be a bumper crop while snap peas can often be limited. The amount of credit will change during the season, generally increasing in July and carrying through to October. 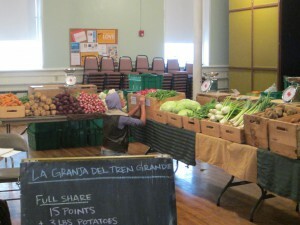 The Big Train Farm CSA is intended for Providence and Providence-area residents. However the CSA pick-up will be held at a time convenient for commuters as well. There are a few things to consider when deciding if a share is right for you. First of all you should love vegetables. If you appreciate vegetables then chances are you can already recognize the difference between store-bought produce and farm-fresh produce. Also, you should appreciate variety. Many different crops are available throughout the growing season and an interest and curiosity to try different things will help. You should decide if the pick-up is convenient for you or not and look at your schedule to see how many pick-ups you might miss. A CSA can save you money, especially when considering the quality of the produce. What If I Can’t Make It To The Pick-Up? 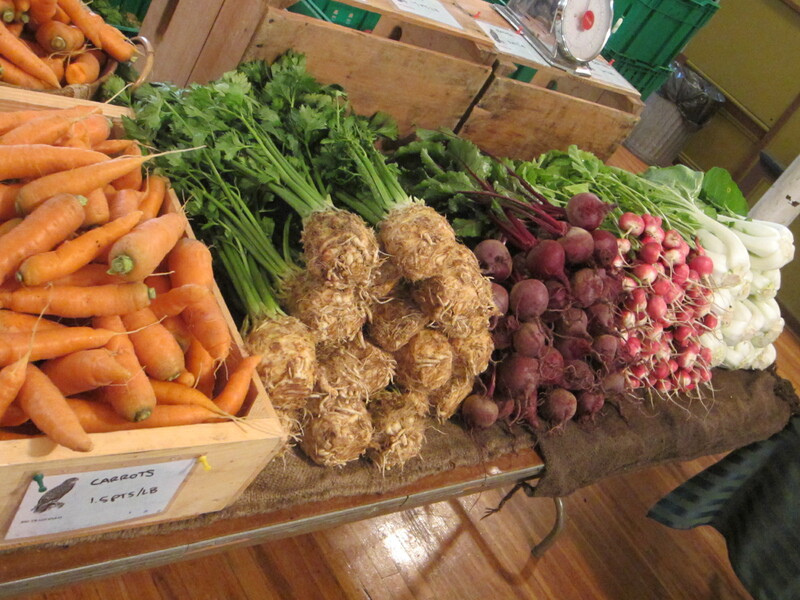 The Farm is in a position to offer you the freshest quality produce you can find. Many things are harvested the day of the pick-up. We have no long-term way to hold your produce for you and are not willing to because we want you to receive the freshest product possible. It is your responsibility to make it to the pick-ups. If you can’t make it arrange with a friend or relative to come in your stead… you can make it worth their while by giving them a portion of your share! If you are without any option feel free to call and we can work something out. If I don’t receive a call I will assume that you are forfeiting your share for that week. It is impossible to “double-up” your share for missed weeks. In taking part in the program you are guaranteed the freshest produce available. Your investment in the farm is deeply appreciated and the CSA members are guaranteed the top quality produce of the harvest, before all others. Your participation does come with risk however. Growing conditions are unpredictable. Certain crops may have unforeseen issues which may lead to your favorite vegetable being in limited supply. Your investment in the farm comes with all the risks associated with investments, and by participating you agree to the risks associated with farming in Rhode Island. CSA membership payments are essential in paying for initial costs in the spring and summer and are non-refundable. Mushrooms, Bread, Flowers, Fruit, Meat and Tea are made available through our CSA by way of other local growers, some whom are located on the same property as Big Train Farm. Payment for additional products will be separate from your vegetable share.